This book will help church pastors and leaders navigate the changing tides in ministry to become the kind of church that families want to attend, where the church's dynamic faith invites families who may then bring their friends. This means reaching out to all kinds of families, some with needs that only a church family can fulfil. To grow and remain vital, churches need to attract families. But the cultural landscape has changed, and any church may have two parent families with children, blended families, boomerang families, adult children of divorce and their families or lack of families, single adults whose family is the church, grandparents parenting again, childless families, cohabitation families, and children with three legal parents. With practical helps and suggestions for ministries, worship, small groups, and even facilities, author and family expert Linda Ranson Jacobs will help you create a welcoming place for everyone. 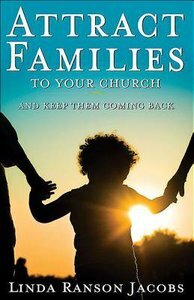 About "Attract Families to Your Church and Keep Them Coming Back"
Linda Ranson Jacobs is a popular church consultant, author, trainer, program developer, and a family expert who regularly writes and speaks to church leaders throughout the United States. Linda is the developer of HLP4 (Healthy, Loving, Partnerships For), a website for single parents and those working with single parents, the creator of DC4K, (DivorceCare for Kids), and a contributing developer ofthe H.E.R.O.E.S. CARE Project, (Homefront Enabling Relationships, Opportunities, and Empowerment through Support). She lives in Navarre, Florida.